Understanding the market segmentation of the movie-going public lies at the core of any movie studios’ marketing strategy. They go to great lengths to understand consumer behaviour because predicting the outcome of the movie before its release is close to impossible. There are many aspiring filmmakers in the country who have had to drop their dreams owing to a rigid system which is more risk-averse. The field of creativity is inherently risky and the success rates, flimsy. Woodcutter Films emerged out of one such dreamer’s passion to revive and connect the craftsmen and the production houses powered by state-of-the-art analytics and diligent assessment strategies. The CEO, Bethanavel Kuppuswamy was an avid film-goer and his love for cinema, storytelling rather, began since the Shaktimaan days. But it was Pudhupettai (2006) which re-kindled his love for cinema and made him take filmmaking seriously. Despite the critical acclaim, Pudhupettai, starring Dhanush, didn’t do well at the box office. This made Bethanavel think about the state of films in general, the promotional strategies and the lack of a platform for independent films. “As an aspiring filmmaker and a student of filmmaking theories, I was able to see how scriptwriting is an art that has structure and grammar. And my tech background helped me realize how technology can be used to help script writers get these fundamentals right and also take learnings from past film scripts,” says Bethanavel. The founder didn’t let his academic endeavours go waste in the creative pursuits. In fact, Woodcutter Films is an amalgamation of passion and technological innovation. Woodcutter Films carved a niche for themselves by combining state-of-the-art technologies with their undying passion to contribute to the cinema. 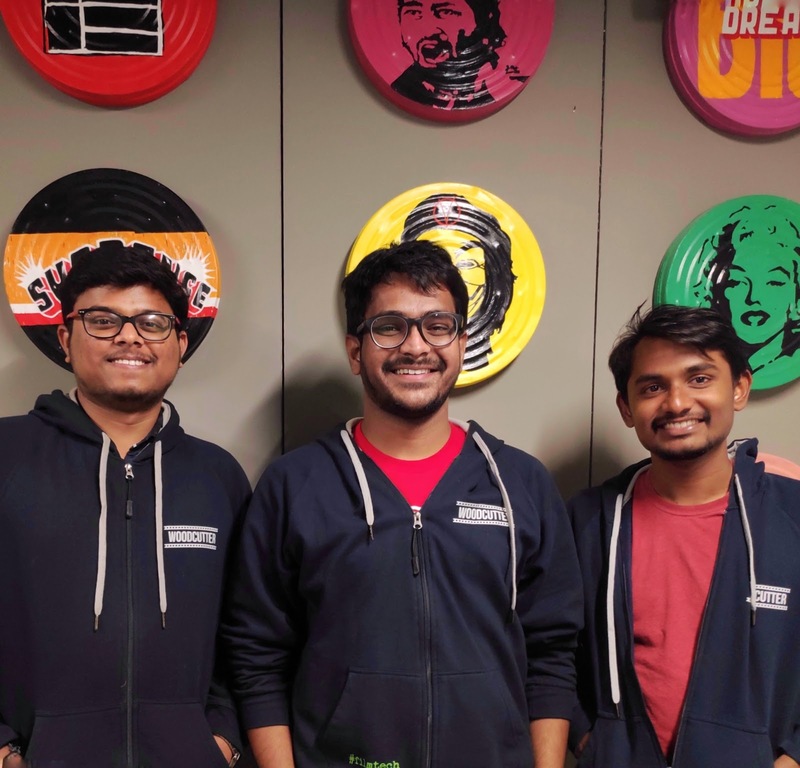 Based out of Hyderabad, Woodcutter Films is a team of five data scientists who have graduated from IIT Madras, along with the founder Bethanavel. Data Analytics in the entertainment industry is still in its nascent stage in India. Netflix deploys recommender systems through collaborative filtering, which regurgitate on the watching history of the audience and the corresponding ratings. Then there is Fox Studios, which has recently run machine learning models to trim the trailers. Whereas in India, there aren’t any successful use cases where a machine learning model is devised to tackle pre-production and promotional hassles. Lack of successful implementations and the sheer complexity of machine learning algorithms made it difficult for the team to convince production houses and film distributors. But the team at Woodcutter Films, didn’t succumb to the usual setbacks like lack of talent pool or successful use cases. So, their most noticeable example is that of descriptive analytics on Fukrey Returns (2017) promotions. The team analysed the audience reactions from the teaser of Fukrey Returns movie and made relevant suggestions to Excel Entertainment team on what kind of actors and dialogues to highlight in the trailer. To convince the stakeholders, the team needed to build a prototype model and, collecting data like box office numbers from local distributors and large production houses was a challenge in itself. “Our major emphasis was on pre-processing the data and adding more features to explain the model better. A lot of iterations were done with different features. We have also been adding more market data to improve our training dataset. All these gradually contributed to our high prediction scores,” said Bethanavel in his interview to Analytics India Magazine. 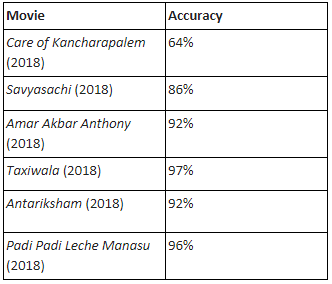 Following are the accuracy scores of the predictions made by the machine learning models built by Woodcutter Films’ data science team for some of the films that were released in the past few months. Human creativity was expected to be the last frontier that would be immune to AI invasion.With such high scores on a consistent basis, Woodcutter Films is poised to create ripples in the film fraternities and production houses. In a short span, Woodcutter Films have managed to partner with the likes of Excel entertainments, Suresh productions and the maestro AR Rahman himself. The immediate goal which lies in front of Woodcutter Films is to help the producers cut costs and empower their decision making backed up by data analytics. There are other interesting projects like Pre-production Consulting and Test Screening under development. These fascinating projects promise to help a film producer/actor in greenlighting new film scripts. Scripts will also be analyzed scene-by-scene using AI tools to get an in-depth understanding of the story elements, character trajectories and success probability. One proposal is to devise a computer vision solution to capture the facial reactions of the audience for building a database of the likes and dislikes of the audience on a more personal level, which would be useful for pre-production consultation offer. Also, the discussions with new age filmmakers in India and leading production houses in Hollywood helped the team in identifying pain-points for the global filmmaker community that needs to be solved. “We aspire to become a one-stop solution for a filmmaker from pre-production phase – scripting, casting, etc. till the movie reaches the audience – promotion and distribution. Right now, filmmaking demands a lot of risk appetite and experience from the makers,” concluded Bethanavel, CEO, Woodcutter Films.